Studio Ghibli's latest (and potentially last) feature When Marnie Was There was released in US cinemas a while ago, but fans in the UK have had to wait. In fact, there had been no news of a British release of the film at all- until now. It's been revealed that the film will be screening at the BFI London Film Festival this October. 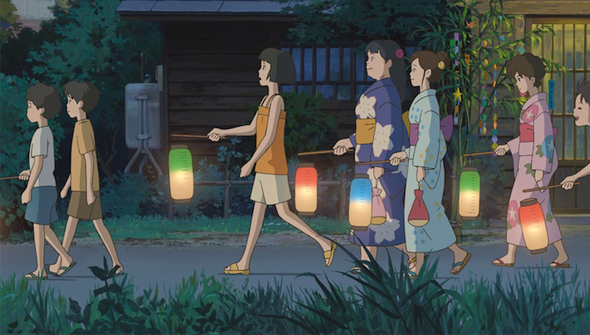 The news confirms that StudioCanal- the company who has distributed all Ghibli's previous films in the UK and Ireland- has acquired the film. It was always likely to have been the case, but it's good to have it confirmed nonetheless. What we don't know however, is when we will see a wider release happen. It's worth noting that The Tale Of The Princess Kaguya played the LFF last October, and was not released properly until this past March. Song Of The Sea had an even bigger gap- having only just been released in July. It's possible the distributor will even wait to see if Marnie can pick up an Oscar nomination next year. Although the film will possibly play some other festivals around the country, this could be your only chance to see the film for quite some time. The screenings will take place October 10th and October 14th. Also playing at the LFF courtesy of StudioCanal is Mamoru Hosoda's eagerly awaited The Boy and The Beast. Hosoda's previous films have been released in the UK by Manga Entertainment, so this marks the first time that StudioCanal have picked up one of his films. With the Ghibli well running dry, it seems like the distributor is looking for more family-friendly anime to fill the gap. The film will screen on October 16th and 17th. Tickets will go on sale September 17th at 10am.